It seems that my neighbors aren't the only new vouyers around here. In checking IP addresses, I've noticed that my ex-wife has visited this blog more than 40 times! It's funny because I couldn't care less what's going on in her life, yet she's obviously very interested in what's going on in mine. My life must be positively fascinating for her to want to read so much about it. 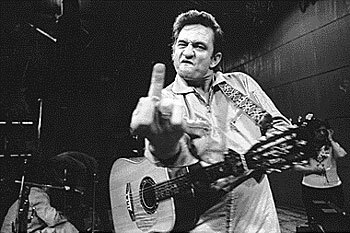 Anyway, here's a special message to her from the late Johnny Cash. Thanks, Mr. Cash. You said it much better than I could.